We live in west central Minnesota and the winters can be fiercely cold. 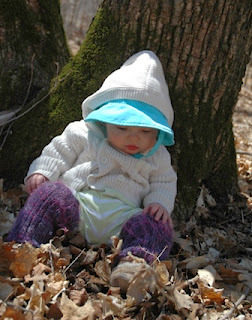 It drives me crazy when I see people carrying their babies around in the winter with an inch or two of bare leg exposed between their pants and their socks. My daughter Amber devised these cute leg warmers for Jasper, her little one. Using homespun or washable wool sock yarn, and four size 3 double point needles, cast on 62 stitches. Join the first stitch and the last stitch, being careful not to twist the circle of stitches. Knit 2, purl 2 around until your piece is 8 inches long. If each needle begins with a knit two, you can get to the point where you can talk, watch TV or even read while you work. Cast off loosely. Repeat for second leg warmer. 1) Separate carded wool into 6 very thin layers. 2) Wrap one layer around the pop can from sided to side. 3) Wrap second layer around the pop can from top to bottom. 4) Repeat, alternating layer directions until you have used up all the wool. 5) Decorate with very thin layers of colored wool and then wrap with yarn. 6) Carefully stretch a nylon stocking around the wool and tie off the nylon at each end. 7) Immerse in hot soapy water. Make sure it is completely wet. 8) Gently rub your can, around and around and up and down. Your fingers should slide across the soapy surface; they should not push the wool around. This takes time, be patient. 9) When the wool feels firm, roll in a towel 100 times. 10) Remove nylon. Rub surface for final fit. Rub felt in the direction you want it to shrink. For example, to make it fit the can more tightly, rub around the can. To make it shorter, rub up and down. Add more soap if your fingers don’t slip across the surface. 11) Cut the felt about ½” from the top. Continue to felt the newly cut edge to smooth it. 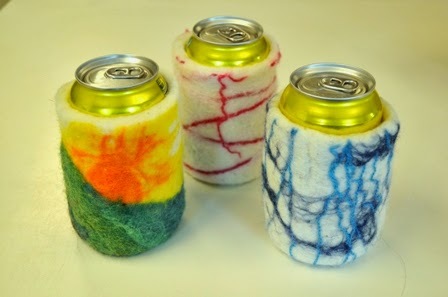 You can remove the can from the felt and put your hand inside. Remember to rub in the direction you want it to change. 12) Rinse well. squeeze out the water, put cosy back on the can to let it dry. 13) When dry, you can embellish with beads or embroidery. Blanket stitch along the cut edge makes it stronger.